Seven years ago, a trip to the grocers for some bread, milk, and three lucky dips proved all that was needed to give Jones what he described as the best day in his life apart from the birth of his son. 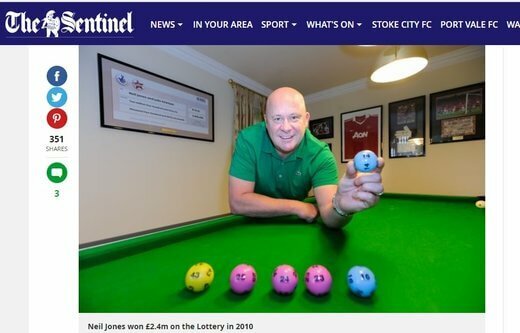 Like most players Jones didn’t bother to check his tickets immediately after the draw – like he never really expected to win. But when he checked a few days later, he discovered that he had won the jackpot; he just didn’t know how much it was. So he asked his wife to call Camelot, who asked Julie is she was sitting down. Then they told her they had won £2.4 million. That led the tiler to retire immediately. But he and his wife have been good stewards to their fortune. A big chunk of it has been invested to give them a regular income. But their lives have been a lot easier. They have traveled a lot, he has a billiard table at home, and he’s even taken up scuba diving. Jones says what he enjoys most is not having to work and not having to worry about bills.